The history of Poluzzi is a story of innovation, ambition and pure and hard work. Since the beginning with the reparation of steel track for tractor in 1982 till today with the production, distribution and sale of steel track for tractor to the global market. In this short period of time, only 33 years we moved from 2 mens who repairs old tractors in a barn in casalvolone to the one of the most popoular and searched brands in tracks manufacturing for steel track for tractor worldwide. All of this thank’s to the discovery and research spirit which moves our hearts. 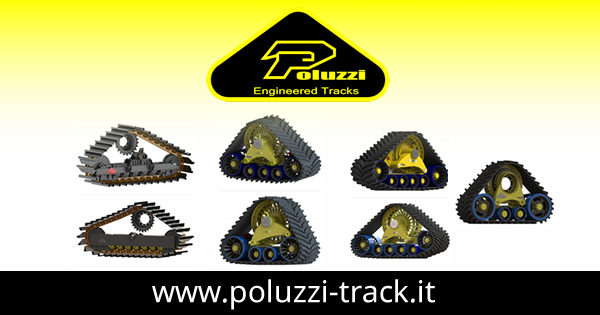 On today Poluzzi is still a “small” family business, where to the project study and the production of each steel track for tractor are dedicated the maximum level of care and attention. Like few knows how to do nowadays. in fact for poluzzi the manufacturing of each product represent a new startup point for new technological developments in near future. LAST MODEL OF steel track for tractor released ( ultron terra drive ) with vertical hydro suspension ( unique in his category ) a real innovation on market. To search for the shortest path to reach, for detailed driving directions, use the map below. Commands: View Larger Map Use the controls in the upper left corner to navigate the map : arrow keys for moving, keys + - to increase or decrease magnification.